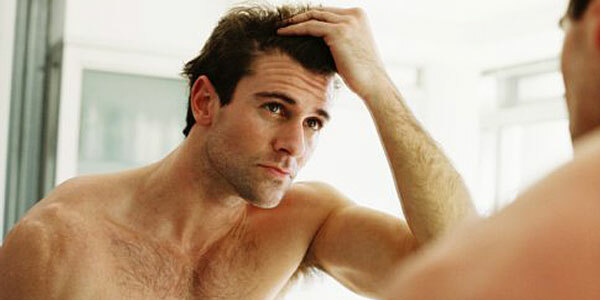 Male pattern baldness is something that will affect over 50 percent of guys as some point in their lives. However, it is more than just your genes that ravage your hair over time. Things like vitamin deficiency, stress, and dry skin, can all effect the health of your mane. Beyond the wonders of minoxidil (Rogaine) and Finasteride (Propecia), regrowing a thinning dome takes a combined effort of improving the health of both your body and mind. The Vitamin Brigade– Vitamins help the body to run at peak efficiency, so it should come as no surprise that if you skimp too much on your raw vegetables and lean meats, it will be hell to pay on your follicles. These are the vitamins that are most important for maintaining the health of your hair. Vitamin K maintains the overall health and balance of your hair. You can find it naturally in green vegetables, oatmeal, and yoghurt. Incidentally, yoghurt also may have the ability to prolong the color in your hair, thus staving off the inevitability of that first gray hair. Biotin is important to keep your scalp from drying out. You’ll find this important vitamin in fish, eggs, and dairy. Vitamin E is an antioxidant, which means it is essential for helping your body repair itself. More importantly for your hair, it improves the blood circulation in your scalp, which researchers believe is one reason why hair follicles starve and eventually die. Look no further than beans, avocados, nuts, and olive oil to keep things flowing up there. Vitamin C also aids in blood circulation. However, in addition, it helps strengthens the hair shaft, making it more resilient to breakage. You’ll find this vitamin in berries, oranges, and limes. Beta-carotene helps the body synthesize proteins, which are the fundamental building blocks of your hair. In other words, you will never maintain healthy hair without eating your carrots, squash, and sweet potatoes. Stress depletes the body of all these vitamins, so if you live a life of high frustration (mileage) and low rest (sleep), no matter what you do, your hair will never be as healthy as it could be.